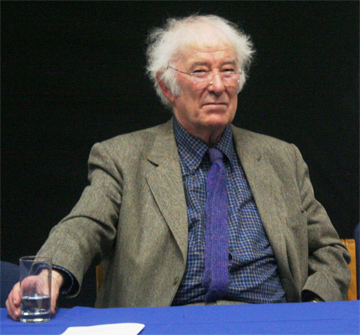 Picture of the Irish poet and Nobel Prize winner Seamus Heaney at the University College Dublin, February 11, 2009. Photographer: Sean O’Connor. The many who heard Seamus Heaney during his three HoCoPoLitSo visits to Columbia (1982,1988 and 1994), the last not long before his being named Nobel Laureate for Literature, are saddened to learn of his recent death at age 74. We treasure the memories of hearing him read his poems no less than the acquaintance we made with his warm and generous person. From his 1982 visit to our 4th Evening of Irish Music and Poetry, we recall the place, our companions, his voice and afterwards the many books he signed and annotated for long lines of admirers. From 1988 we prize our “Afternoon with Seamus Heaney” video. He read from his poems, talked with his friend George O’Brien, and responded to questions from a Smith Theater audience. Edited down to one hour, this TV program aired locally in Maryland in January 1989. 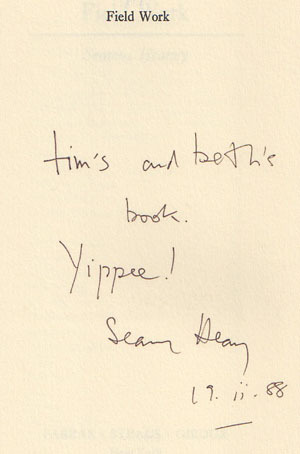 The circumstances of Heaney’s third visit in 1994 were dramatic. Close to 700 advance tickets sold for his evening appearance at the Interfaith Center in Columbia, but a winter blizzard had closed even the Kennedy Center in Washington. Traffic in the region was paralyzed, and only a few highways were passable. Nonetheless, about 230 people, some hiking through the snow, arrived to hear him. Earlier in the day a skeleton crew opened the Howard Community College TV studio, this time to record a half hour interview with Heaney reading several new poems – hosted by Roland Flint. The one hour 1988 program aired again in 1995 to celebrate our favorite Irish poet’s Nobel Prize. A video collection of Seamus Heaney reading his work. By hocopolitso in Irish Evening on September 17, 2013 .